I share something different... I give Tina sunflowers, words, music and tears. May Tina find her place in the heavens and shine down on those who need it most. Jeremy, that is wonderful! You would make her cry. She is indeed shining down from Heaven. As they say in Dublin, "Sorry for your troubles." That's sweet you made a little music video for her. She was such a sweet person. This is an amazing tribute! Well done, Jeremy. Great choice for the song. I think Tina would have loved this. And would have been so happy to see the the blog world lit up with these sunny flowers. Life is Good. and i'm crying again.so beautiful. That's the perfect song choice, Jeremy-- and those sunflowers look gorgeous. A wonderful tribute Jeremy to wonderful woman. Great job. This was so touching and makes my heart ache for Tina's family and everyone close to her. This is so beautiful. It's nice to see this kind of outpouring for Tina! That was an amazing tribute, Jeremy. Thank you so much! That's a beautiful song and lovely tribute, Jeremy. Dragon Hugs! How wonderful. I think that is so thoughtful and beautiful. What a thoughtful friend you are with this truly incredible tribute. You have touched our hearts and given Tina a special gift of heavenly peace and love. Thank-you. Jeremy I just read your comment on Pam's tribute and had to come here quickly to say you are so right about what you said...Tina would love the attention while telling us it's all more than she would expect. The song in your tribute reminds me of a long sundress that I used to have...it was blue with sunflowers all over it and one of my friends often teased me for wearing it, calling it a "house on the prairie dress." Now I wish I still had it somewhere, to wear today since the Summer weather is good for it and it would be another great way to honor and remember Tina. Love your flowers, music and words, Jeremy! I wasn't fortunate enough to know Tina, but I've been reading her blog, and she was such an awesome person. I'll continue to go through her site to get to know her better. I'm crying. I wasn't close with Tina but wish I had been. Only 10 days or so before her passing, she wrote to me "Here's to getting to know you better." I quickly perused the message as if it read: "Here's to getting to know each other better." When I re-read it after she passed, I realize she was saying "you're special. This isn't about me." What an incredibly selfless soul she was. Your tribute is incredibly heartfelt and beautiful. I'm sorry you lost such a close friend, Jeremy. 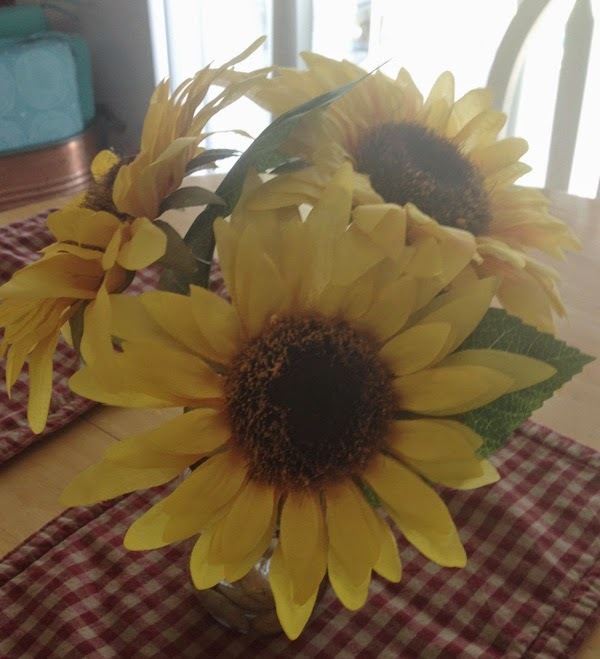 Seeing the outpouring of love, and seeing sunflowers, is smile-inducing, as was Tina. I wish we hadn't had to do these tributes--I'd rather still have Tina with us. That video was so awesome. There are no words. Tina would love this. Thanks Jeremy for the song and tribute! Lovely and fitting. This is such an awesome tribute!!! What a breathtakingly beautiful tribute. I didn't know her much, but seeing the tributes, especially this one, makes me understand even more what a special person she was. Wow, wonderful tribute. Tina is surely smiling down on us now. Beautiful combo of music, images, and words. Thanks for sharing! Beautiful video and picture. These sunflowers posts and tributes for Tina are lovely. So wonderful that you did a musical tribute for her, as well!